In this major statement, the renowned French philosopher Simone de Beauvoir delves into the problem of Existentialist ethics, defending the philosophy against charges of nihilism. 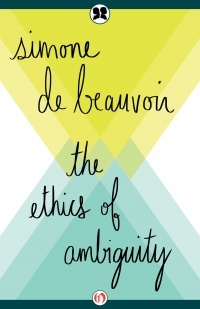 A classic of Existentialist thought, French philosopher Simone de Beauvoir’s The Ethics of Ambiguity simultaneously pays homage to and grapples with her French contemporaries, philosophers Jean-Paul Sartre and Maurice Merleau-Ponty, arguing that the radical freedoms at the foundation of Existentialism carries with it certain ethical responsibilities. Referencing competing responses to the horror and absurdity of the modern world (e.g., Nihilism, Pragmatism, Surrealism) as well as the classic pre-20th century philosophers from Plato to Marx, The Ethics of Ambiguity provides a thorough examination of existence and what it means to human values, human life itself. Ultimately, de Beauvoir argues that in order to achieve true freedom, one must battle against the choices and activities of those who suppress it.